I have to start by saying that this was one of the most incredible experiences we have ever had as a family. It surpassed all of our expectations and is something that we will remember and treasure forever. 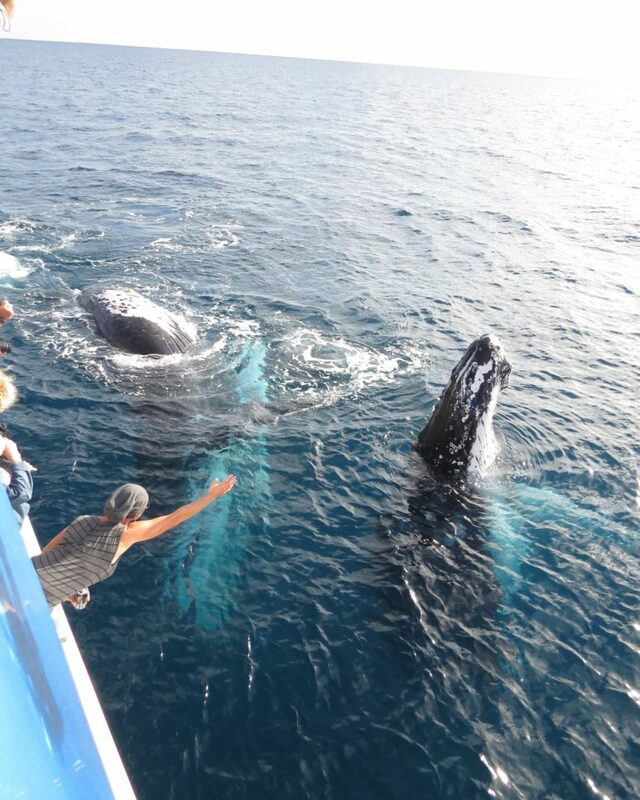 Whale watching is an experience that has been on our bucket list for as long as I can remember. To finally get the chance to do this was a dream come true and an experience I will now always­ recommend to absolutely anyone and everyone. 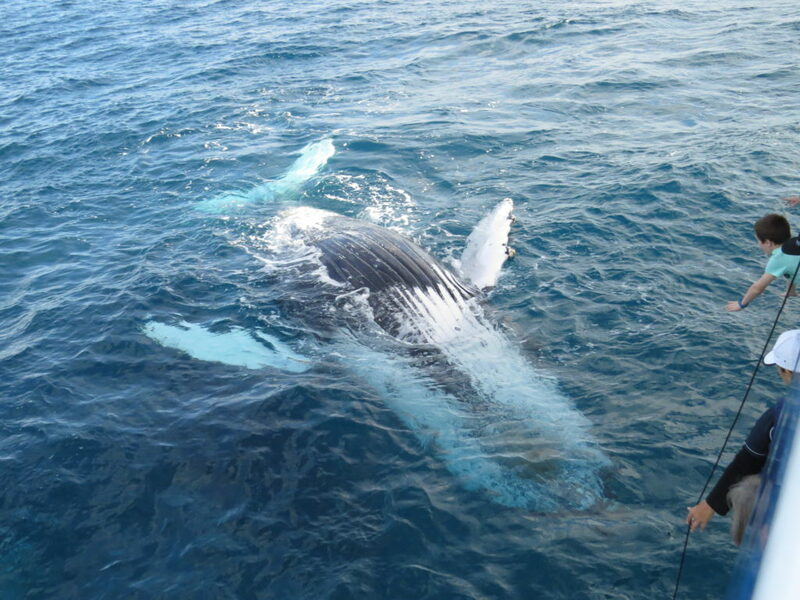 A coastal city on the Fraser Coast in southern Queensland, Hervey Bay is synonymous with whales and whale watching. 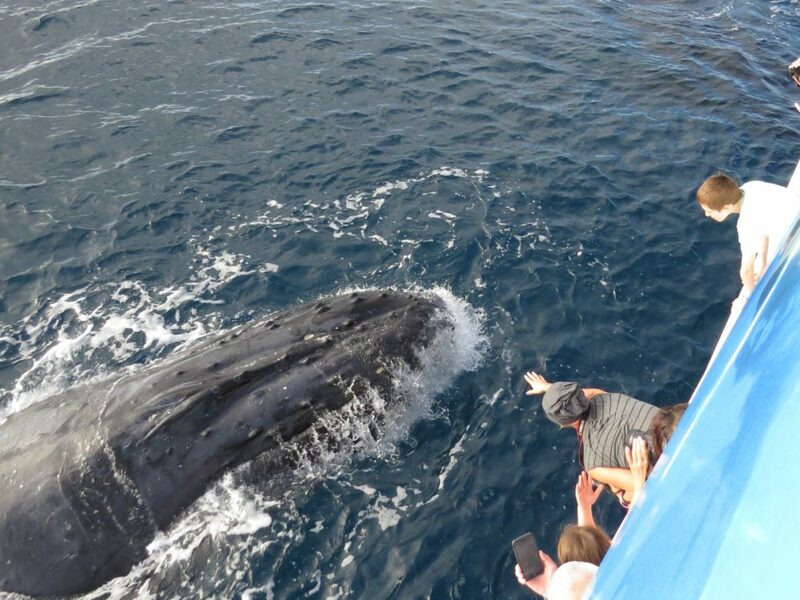 In fact, it is often referred to as the whale watching capital of the world. 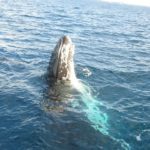 Every year, between April and October, thousands of humpback whales migrate from Antarctica, along the coast, to the warmer waters of the tropics for calving. 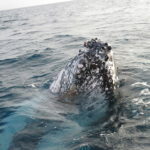 It is during these months that tourists from all over the world flock to Hervey Bay to witness, up close, these majestic creatures of the sea. 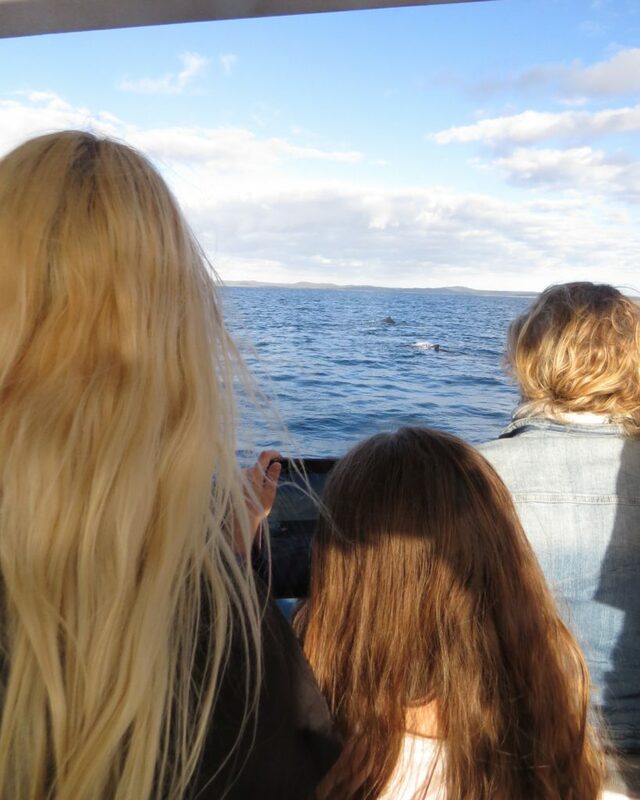 When we told our kids that we were going on a 4 hour long whale watching cruise they were beyond excited. 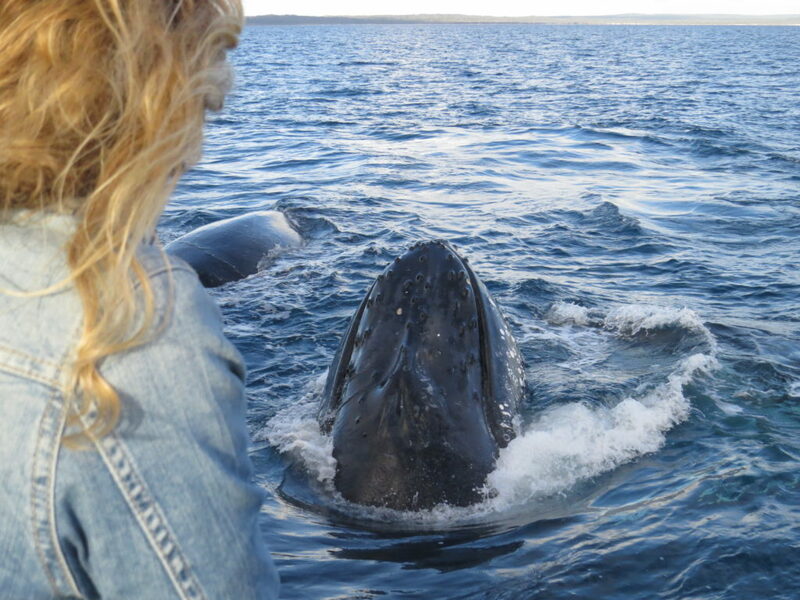 And like us, they didn’t even realise just how incredibly close we were going to get to the whales! 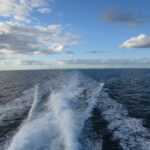 Our cruise was a half day afternoon cruise with Tasman Venture. With a crew combining over 70 years experience, the company are clear leaders in the industry and this was reflected in every aspect of our experience. 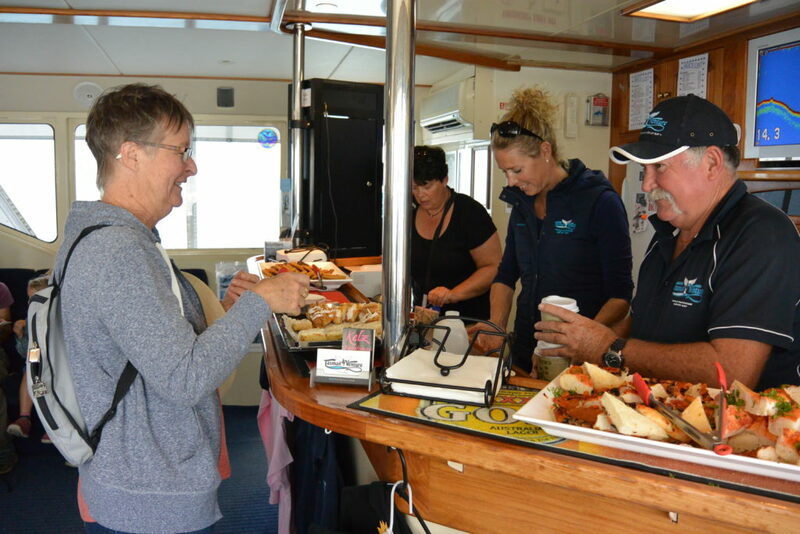 From the state of the art vessel – a fast and luxurious catamaran complete with underwater viewing rooms and it’s famous water level viewing platform, to the friendly and knowledgeable staff, everything has been thought of and executed to the highest of standards. 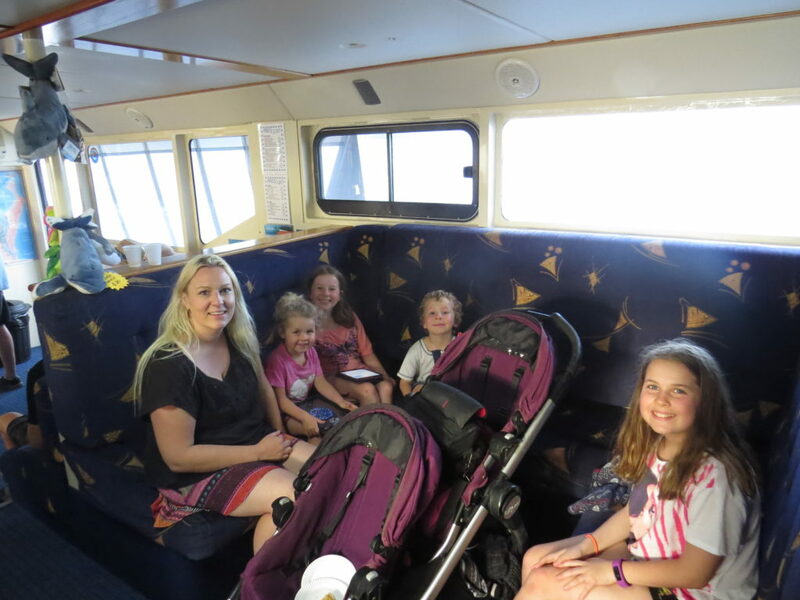 As we boarded the catamaran with our large double pram and myriad of excited children, we were greeted warmly, and shown to a spacious lounge area inside where we all, including our pram, had plenty of room to sit comfortably and base ourselves. 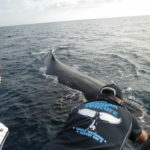 The company limits the number of passengers they take on each cruise, ensuring everyone has plenty of room to move about the vessel as well as having unobstructed views of the whales from one of the six spacious viewing decks. Over our four hours on board we moved around the vessel a lot, going from inside to outside, lower deck to upper deck, and never felt crowded or that we were in anyone else’s way. Shortly after departure, afternoon tea was served. Platters of pizza-style savoury bread, cakes, slices and cookies were laid out at the bar for passengers to help themselves to. Our kids thought this was fantastic and probably went back more times than they should have. I don’t blame them though. The food was really delicious. I think the lemon slice was probably the best I’ve ever had (sorry Mum)! As I was standing there, baby Ben in one arm, camera in the other, snapping away and thinking how unbelievable it was to be experiencing this right in front of my very eyes, the whales began to come closer. And closer. And closer! Before I knew it they were mere metres from the boat. My initial emotion was panic…… “Um…..is this ok? Are we safe? Should someone do something?” In that moment I expected to see crew running around, ushering people inside, yelling out to fire up the engine. But they didn’t. Instead, they all looked just as happy and as excited as the passengers! As my panic gave way to excitement, a crew member began talking into the PA system, explaining what was happening. 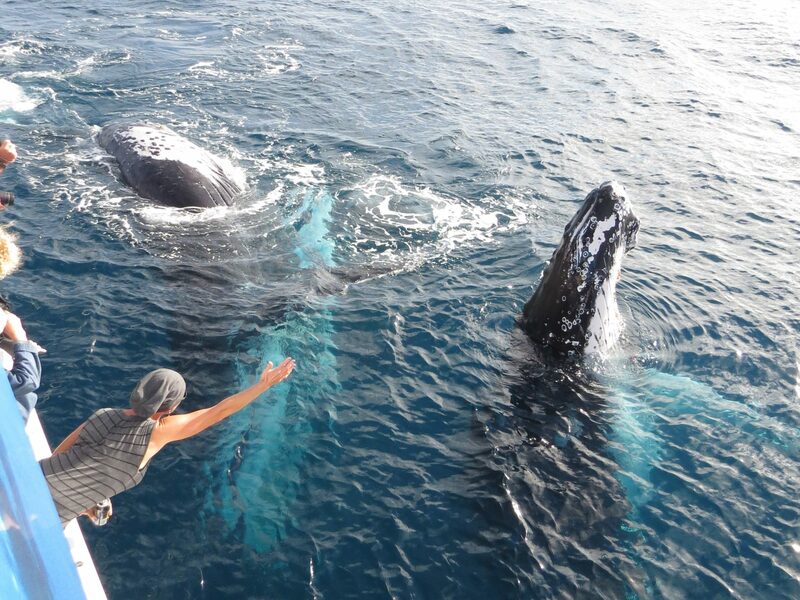 We were being mugged by the whales! 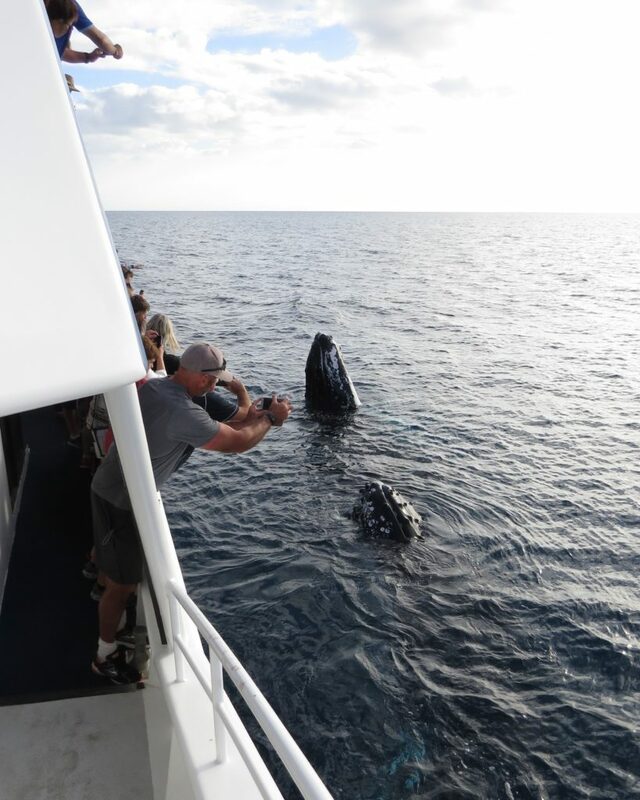 ‘Mugging’ is a term used to describe when whales approach the boat to check out who’s checking them out! It was absolutely phenomenal! It genuinely seemed as though they were putting on a show for us. They swam around and under the boat and regularly ‘spy-hopped’ (poked their heads above the surface to get a good look at us). Over the next two hours we were treated to encounter after encounter, show after show. 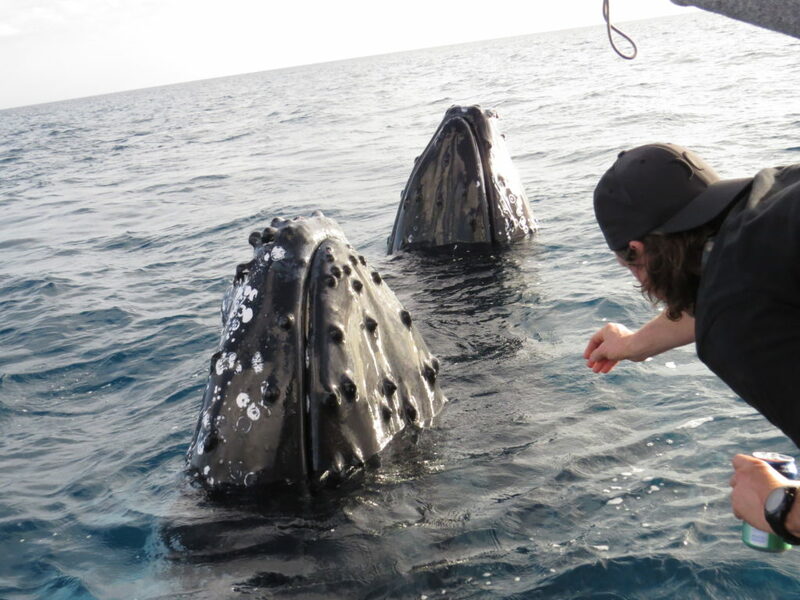 The final pod we encountered was made up of three whales and they definitely put on the most incredible show for us. 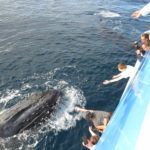 People were reaching over the boat, appearing to come within inches of touching them. They breached and spy-hopped and swam back and forth under the boat for such a long time. It was simply unbelievable! Our kids couldn’t contain their excitement and Peter and I followed them around from deck to deck and up and down the stairs to the underwater viewing rooms over and over and over again. 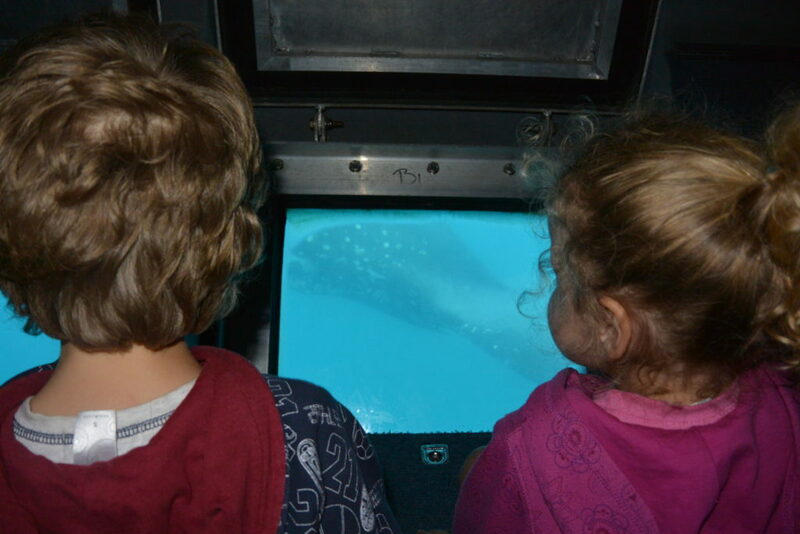 The underwater viewing rooms were really quite amazing and a real highlight for our kids. 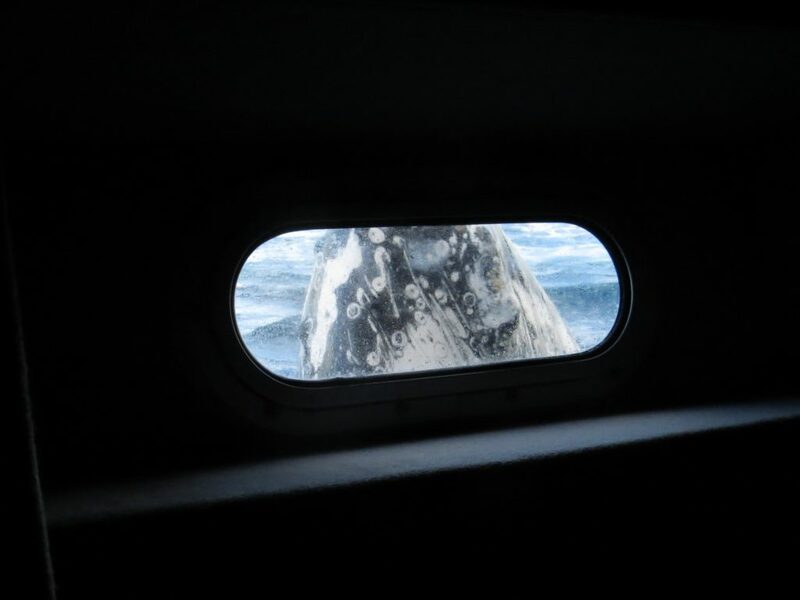 Staring through the glass into the water, waiting for a whale to appear and when one does, being so unbelievably close to it, actually seeing the markings on it’s skin – just surreal! To top it all off, the crew lowered a microphone into the water and we were able to hear the whales ‘singing’ as we watched them. I was actually unaware they were doing this and when I first began to hear it I thought Ben (who was in the carrier on Peter down the other end of the boat) was starting to cry. 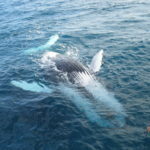 Peter later told me it may well have been Ben that I heard as he began mimicing the whales songs, ‘wailing’ along! 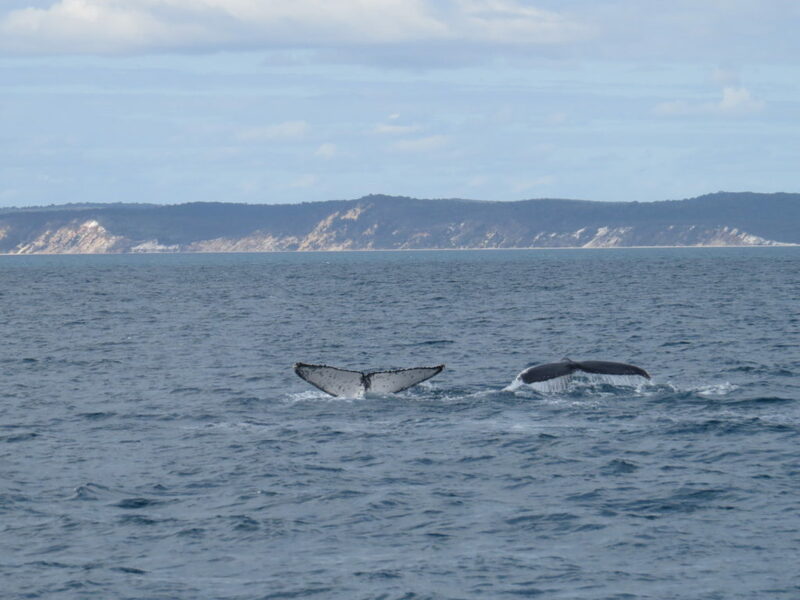 About half an hour before we were due back at the marina, the whales suddenly, simultaneously stopped showing off and slowly, gracefully swam away. It was almost as if they had checked their watches and realised it was time for us to head back! Even the return trip was fun. Platters of cheese, biscuits, olives and cabana were served and staff brought our little kids colouring and toys to keep entertained, while our big girls made use of the free on-board wifi. We disembarked the boat on an incredible high, in sheer disbelief of what we had just experienced. 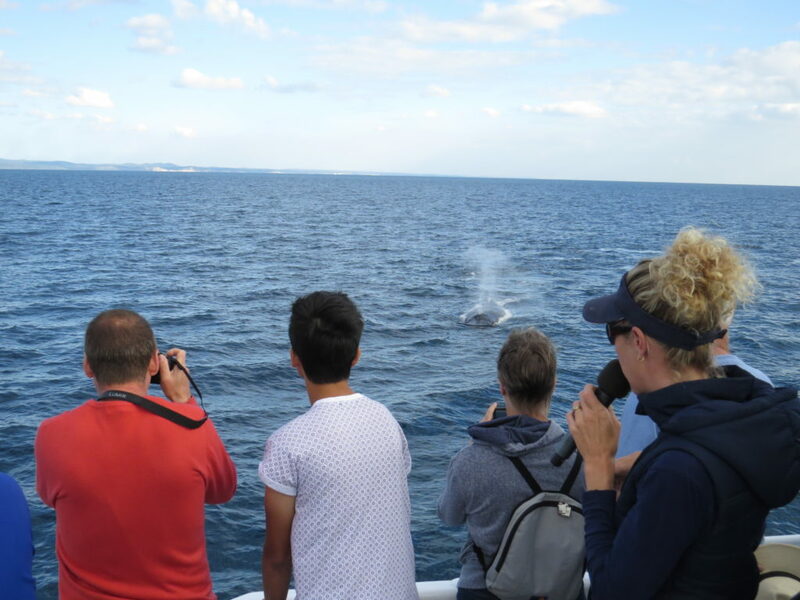 Our Hervey Bay whale watching experience with Tasman Venture is definitely a day we will never forget! 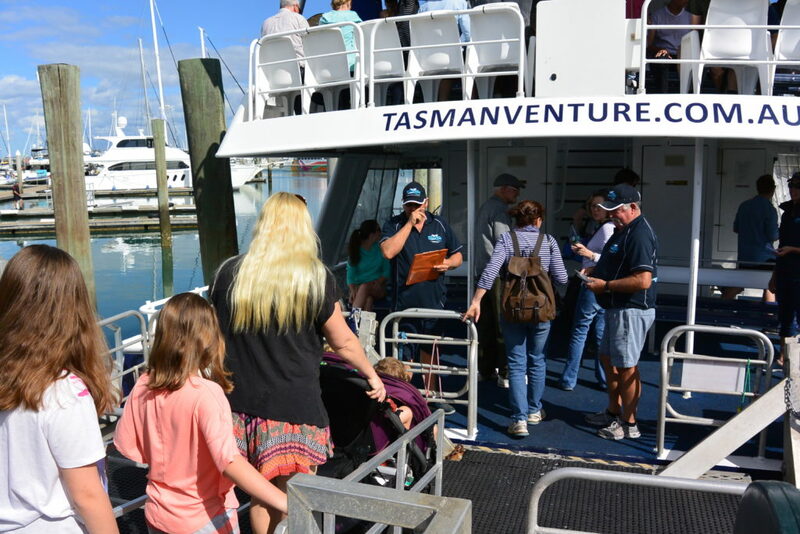 Disclaimer: We were sponsored guests of Tasman Venture. All experiences shared and opinions expressed in this article are our own and are in no way influenced by sponsorship.